Here at The Motley Fool, I've long cautioned investors to keep a close eye on inventory levels. It's a part of my standard diligence when searching for the market's best stocks. I think a quarterly checkup can help you spot potential problems. For many companies, products that sit on the shelves too long can become big trouble. Stale inventory may be sold for lower prices, hurting profitability. In extreme cases, it may be written off completely and sent to the shredder. In this series, I examine inventory using a simple rule of thumb: Inventory increases ought to roughly parallel revenue increases. If inventory bloats more quickly than sales grow, this might be a sign that expected sales haven't materialized. Is the current inventory situation at Schweitzer-Mauduit International (NYS: SWM) out of line? To figure that out, start by comparing the company's inventory growth to sales growth. How is Schweitzer-Mauduit International doing by this quick checkup? At first glance, OK, it seems. Trailing-12-month revenue decreased 1.6%, and inventory decreased 1.9%. Comparing the latest quarter to the prior-year quarter, the story looks decent. Revenue shrank 3.0%, and inventory shrank 1.9%. Over the sequential quarterly period, the trend looks healthy. Revenue dropped 2.6%, and inventory dropped 6.3%. A company ramping up for increased demand may increase raw materials and work-in-progress inventory at a faster rate when it expects robust future growth. As such, we might consider oversized growth in those categories to offer a clue to a brighter future, and a clue that most other investors will miss. We call it "positive inventory divergence." On the other hand, if we see a big increase in finished goods, that often means product isn't moving as well as expected, and it's time to hunker down with the filings and conference calls to find out why. 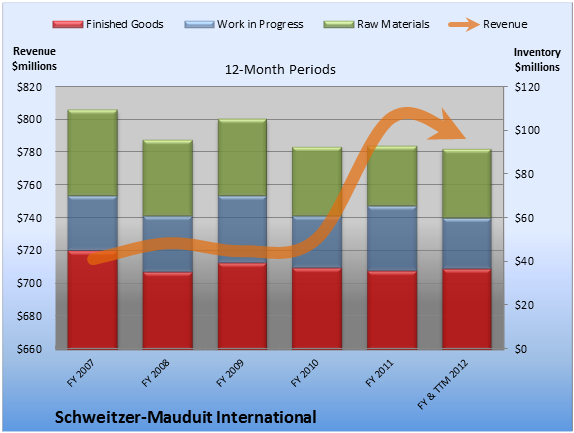 What's going on with the inventory at Schweitzer-Mauduit International? I chart the details below for both quarterly and 12-month periods. Source: S&P Capital IQ. Data is current as of latest fully reported quarter. Dollar amounts in millions. FY = fiscal year. TTM = trailing 12 months. Source: S&P Capital IQ. Data is current as of latest fully reported quarter. Dollar amounts in millions. FQ = fiscal quarter. Let's dig into the inventory specifics. On a trailing-12-month basis, raw materials inventory was the fastest-growing segment, up 13.7%. On a sequential-quarter basis, raw materials inventory was also the fastest-growing segment, up 13.7%. 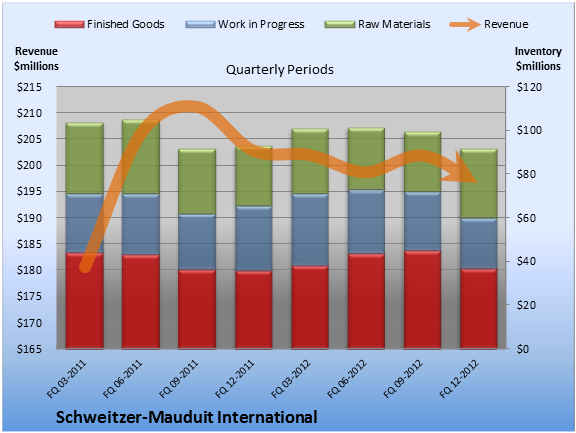 Schweitzer-Mauduit International seems to be handling inventory well enough, but the individual segments don't provide a clear signal. Schweitzer-Mauduit International may display positive inventory divergence, suggesting that management sees increased demand on the horizon. When you're doing your research, remember that aggregate numbers such as inventory balances often mask situations that are more complex than they appear. Even the detailed numbers don't give us the final word. When in doubt, listen to the conference call, or contact investor relations. What at first looks like a problem may actually signal a stock that will provide great returns. And what might look hunky-dory at first glance could actually be warning you to cut your losses before the rest of the Street wises up. Looking for alternatives to Schweitzer-Mauduit International? It takes more than great companies to build a fortune for the future. Learn the basic financial habits of millionaires next door and get focused stock ideas in our free report, "3 Stocks That Will Help You Retire Rich." Click here for instant access to this free report. Add Schweitzer-Mauduit International to My Watchlist. The article 1 Reason to Expect Big Things from Schweitzer-Mauduit International originally appeared on Fool.com.